Product #3415 | SKU DC500D-P | 0.0 (no ratings yet) Thanks for your rating! Delkin Pop-Up Shades are LCD screen protective covers, which double as glare guards. 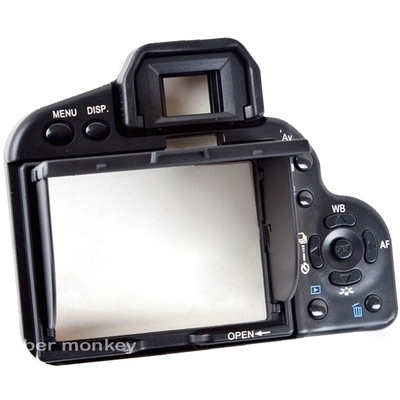 These sturdy, lightweight covers are easily installed (and removed), protect a digital camera's expensive LCD screen in the closed position, and pop up to provide easier viewing of the display in bright sunlight. The Digital SLR Professional Shade is designed to attach to your camera using the existing eye piece and slots around your display. It easily snaps on and off, and features an optical clear glass to protect your camera's screen. The simple pop-up design allows for easy opening to block the glare. Buttons on the Professional shade are aligned with your camera, to reduce the wear and tear on delicate parts and components. This device is also available for the following models: Canon 1Ds mark II, Canon 40D, Canon Rebel XTi, Canon Rebel XSi, Canon Rebel T2i, Canon 50D, Canon 5D Mark II, Canon 7D, Nikon D300, Nikon D3000, Nikon D60, Nikon D80, Nikon D40 and D40x, Nikon D3, Nikon D90, Nikon D700, Nikon D300S and Sony A100.